"2014 World Cup" បញ្ជូនបន្តមកទីនេះ។ ចំពោះthe video game សូមមើល 2014 FIFA World Cup Brazil (video game)។ For other competitions, see 2014 World Cup (disambiguation). Expression error: Unrecognized punctuation character "១". The 2014 FIFA World Cup will be the 20th FIFA World Cup, an international men's football tournament that is scheduled to take place in Brazil from 12 June to 13 July 2014. It will be the second time that Brazil has hosted the competition, the previous being in 1950. Brazil was elected unchallenged as host nation in 2007 after the international football federation, FIFA, decreed that the tournament would be staged in South America for the first time since 1978 in Argentina, and the fifth time overall. The national teams of 31 countries advanced through qualification competitions that began in June 2011 to participate with the host nation Brazil in the final tournament. A total of 64 matches are to be played in twelve cities across Brazil in either new or redeveloped stadiums, with the tournament beginning with a group stage. For the first time at a World Cup Finals, the matches will use goal-line technology. With the host country, all world champion teams since the first World Cup in 1930 (Argentina, England, France, Germany[nb ២], Italy, Spain and Uruguay) have qualified for this competition. Spain is the defending champion, having defeated the Netherlands 1–0 in the 2010 World Cup final to win its first World title. The previous four World Cups staged in South America were all won by South American teams. In March 2003, FIFA announced that the tournament would be held in South America for the first time since 1978, in line with its then-active policy of rotating the right to host the World Cup among different confederations. The decision meant that it would be the first time that two consecutive World Cups will be staged outside Europe. Only Brazil and Colombia formally declared their candidacy but, after the withdrawal of the latter from the process, Brazil was officially elected as host nation unopposed on 30 October 2007. The following 32 teams, shown with October 2013 rankings used for seeding in the draw, qualified for the final tournament. Twelve venues (seven new and five renovated) in twelve cities were selected for the tournament. The venues cover all the main regions of Brazil and create more evenly distributed hosting than the 1950 finals in Brazil. Consequently, the tournament will require long-distance travel for teams. During the World Cup, Brazilian cities will also be home to the participating teams at 32 separate base camps, as well as staging official fan fests where supporters can view the games. The base camps will be used by 32 national squads to stay and train before and during the World Cup tournament. On 31 January 2014, FIFA announced the base camps for each participating team, having earlier circulated a brochure of 84 prospective locations. 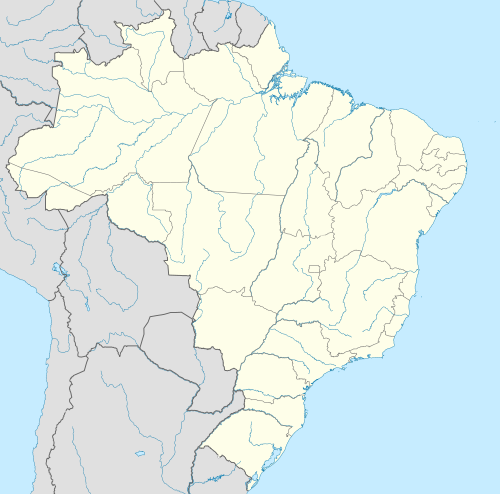 Only five teams have opted to stay in the northern region of Brazil. For a third consecutive World Cup tournament, FIFA announced that they would be holding FIFA Fan Fests in each of the twelve host cities. Prominent examples are the Copacabana Beach in Rio de Janeiro, which already held a Fan Fest in 2010, São Paulo's Vale do Anhangabaú and Brasília's Esplanada dos Ministérios, with the Congress in the background. The official "kick-off event" for the 2014 Fan Fest took place on Iracema Beach, in Fortaleza, on Sunday, June 8, 2014, according to information on FIFA's official website. The official ball of the 2014 World Cup will be the Adidas Brazuca. The name was selected by a public vote that received responses from more than 1 million Brazilian football fans; "Brazuca" received over 70 per cent of the vote. It is produced by Adidas, the official FIFA World Cup match ball supplier since 1970. For the first time at a World Cup Finals, the officials will be assisted by goal-line technology. The previous World Cup was a catalyst for the decision to adopt technology after England were wrongly denied a goal in their Round of 16 tie against Germany. Following the mistake in this game, FIFA President Sepp Blatter said "it would be a nonsense not to reopen the file on goal-line technology" and in 2012 the IFAB approved its usage. This is the fourth FIFA competition to use the technology after successful trials at 2012 Club World Cup, 2013 Club World Cup and 2013 Confederations Cup. The German company GoalControl was selected as the tournament's official goal-line technology provider in October 2013. Following successful trials, FIFA approved the use of vanishing spray by the referees for the first time at a World Cup Finals. [nb ៣] The water-based spray, which disappears within minutes of application, may be used to mark a ten-yard line for the defending team during a free kick and also drawn where the ball is to be placed for a free-kick. The first round, or group stage, is a round-robin competition between thirty-two teams divided into eight groups. The two best teams of each group will progress to the knock-out stage. In the knockout stage there will be four rounds each eliminating the losers. The four rounds are the round of 16, quarter-finals, semi-finals, and the final (plus a play-off for third place). A draw in the knockout stages will be followed by two 15 minute periods of extra time to determine a winner. If the teams are still tied, a penalty shootout will be held. Forecasts on the eve of the tournament estimate the cost to the Brazilian government will be $14 billion, making it the most expensive World Cup to date. FIFA is expected to spend $2 billion on staging the finals, with its greatest single expense being the $576 million prize money pot. Although organisers originally estimated costs of US$1.1 billion, a reported US$3.6 billion has ultimately been spent on stadium works. Five of the chosen host cities have brand new venues built specifically for the World Cup, while the Estádio Nacional Mané Garrincha in the capital Brasilia was demolished and rebuilt, with the remaining six being extensively renovated. An additional R$3 billion (US$1.3 billion, €0.96 billion, £0.78 billion at June 2014 rates) has been earmarked by the Brazilian government for investment in infrastructure works and projects for use during the 2014 World Cup and beyond. However, the failed completion of many of the proposed works has provoked discontent among some Brazilians. The Brazilian government has pledged $900 million will be invested into security forces and that the tournament will be "one of the most protected sports events in history". The marketing of the 2014 FIFA World Cup includes sale of tickets, support from sponsors and promotion through events that utilize the symbols and songs of the tournament. The mascot of the tournament is an armadillo named Fuleco. It is at the same time the most popular merchandise thogether with the caxirola a percussion instrument produced for the spectators. The official song for the tournament will be "We Are One (Ole Ola)" by Pitbull, Jennifer Lopez and Claudia Leitte. An official video game was developed by EA Sports and released in April 2014. For a fourth consecutive FIFA World Cup Finals, the coverage will be provided by HBS (Host Broadcast Services), a subsidiary of Infront Sports & Media. Sony has been selected as the official equipment provider and has built twelve bespoke high definition production 40-foot-long containers, one for each tournament venue, to house the extensive amount of equipment required. Each match will utilise 37 standard camera plans, including Aerial and Cablecam, two Ultramotion cameras and dedicated cameras for interviews. The official tournament film, as well as three matches[nb ៥] will be filmed with ultra high definition technology (4K resolution), following a successful trial at the 2013 FIFA Confederations Cup. The broadcasting rights – covering television, radio, internet and mobile coverage – for the tournament are sold to media companies in each individual territory either directly by FIFA, or through licensed companies or organisations such as the European Broadcasting Union, Organización de Televisión Iberoamericana, International Media Content, Dentsu and RS International Broadcasting & Sports Management. The sale of these rights accounts for an estimated 60% of FIFA's income from staging a World Cup. 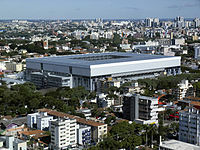 The International Broadcast Centre is situated at the Riocentro in the Barra da Tijuca neighbourhood of Rio de Janeiro. Prior to the opening ceremony of the 2013 FIFA Confederations Cup at the Brasilia National Stadium, demonstrations took place outside the venue, organised by people unhappy with the amount of public money spent to enable the hosting of the FIFA World Cup. Both the Brazilian president Dilma Rousseff as well as FIFA president Sepp Blatter were heavily booed as they were announced to conduct their speeches at the tournament's opening, which resulted in FIFA announcing that the 2014 World Cup opening ceremony would not feature any speeches. The demonstrations and discontent were part of wider unrest and rioting in Brazilian cities initially sparked by increased ticket prices on public transport, but growing to express deeper public disenchantment with the government's financial management of the country. Further protests took place outside other matches during the Confederations Cup. Blatter said that the protesters "should not use football to make their demands heard", and that the public expenditure on staging the tournaments was on "items that are for the future, not just for the World Cup". President Rousseff responded with a public address in which she stated: "the federal money spent on the stadiums is in the form of financing that will be duly repaid by the companies and governments that are exploiting these stadiums". After numerous deaths in football stadiums, Brazil passed a law in 2003 outlawing alcohol sales in stadiums. FIFA demanded that Brazil allow alcohol sales at the World Cup because Budweiser, a major World Cup sponsor is the "Official Beer of the FIFA World Cup", a role it has played since 1986. In response, Brazil passed a law paving the way for alcohol sales in the World Cup, nicknamed the "Budweiser Bill". ↑ The Portuguese pronunciation is [ˈkɔpɐ du ˈmũdu dɐ ˈfifɐ bɾɐˈziw ˈdojz ˈmiw i kɐˈtoʁzi], in Brazil's standard pronunciation. ↑ This is the time zone of ten of the twelve venues; the other two, Cuiabá and Manaus, are in the Amazon time zone (UTC−4), therefore for matches hosted at these two venues the local kickoff times are one hour earlier than the times listed below. The match schedule was announced at FIFA's headquarters in Zürich on 20 October 2011. The kick-off times were confirmed on 27 September 2012. After the final draw, the kick-off times of seven matches were adjusted by FIFA. ↑ Brazil Moves To Ease Soccer Beer Ban, As World Cup Spat With FIFA Grows, NPR (March 07, 2012). ↑ Brazilian Senate approves ‘Budweiser bill’ ending dispute with FIFA over World Cup sponsoring, Merco Press, (May 10, 2012). Notes: There was no qualification for the 1930 World Cup as places were given by invitation only. In 1950, there was no final; the article is about the decisive match of the final group stage.